Did you ever develop skin rashes or inflammation after you ate or touched something? Then, the chances are that you’re allergic to whatever you touched or ate. Swelling, changes in skin color, redness of the skin, a burning sensation are all signs that indicate skin allergies. This problem can affect any region of the body. Certain foods such as shellfish and nuts and cosmetics are the most common reasons for a skin allergy. While your dermatologist will prescribe antibiotic creams and medications to treat it, you can also try applying some of these simple home remedies to combat it at home. Continue reading this article to know the most effective home remedies for skin allergy in children & adults. There are many types of skin allergies. Let’s check out! Seborrheic dermatitis: This type of skin allergy mostly affects the scalp, forehead, cheeks, brows, and external ears, and results in scaly, red, and itchy lesions. Atopic dermatitis (Eczema): It often results in red itchy rashes on the back of the knees and elbows. Psoriasis: A bumpy and scaly eruption that usually occurs on the elbows, scalp, and knees. Diaper rash: This type of skin allergy mainly affects infants and a few adults wearing diapers soiled with urine and feces for too long. Heat rash (Miliaria): A skin allergy caused due to the occlusion of sweat ducts during humid and hot weather conditions. Hives: Sudden onset of itchy and red bumps that typically resolve in about eight hours and recur regularly. Stasis dermatitis: It happens on the lower legs of people suffering from chronic swelling. Nummular eczema: This type of skin allergy surfaces as coin-shaped spots on dry skin during winters. Contact dermatitis: Contact dermatitis makes skin inflamed or red after contact with an irritant or an allergen. A skin allergy might be a result of different underlying causes, but the result is mainly the same – itchy rashes and swelling on your skin. 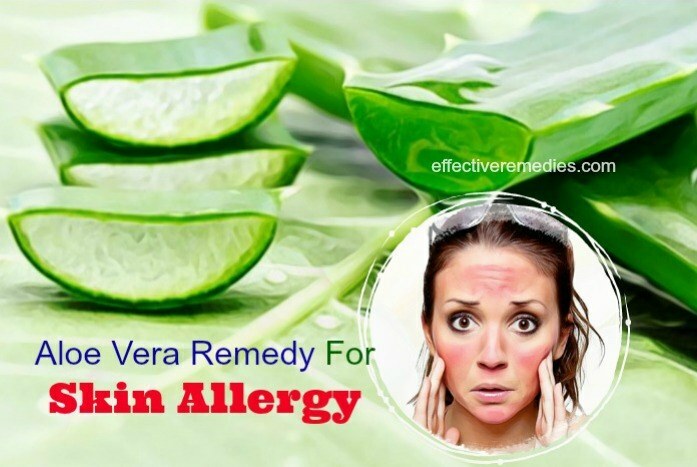 We have listed out the following home remedies to help you battle skin allergies. Aloe vera contains amazing antifungal, antibacterial, and anti-inflammatory properties, which work wonders for your skin. Apply aloe vera regularly is helpful for promoting healing of the affected region. Its anti-inflammatory activities help alleviate the redness and itchiness. Take some aloe vera leaves and extract the gel from them. Apply the gel directly to your affected areas. Let the application work on for a minimum of 30minutes and wash it off afterward. Do this remedy thrice daily for several days for quick results. If you’re allergic to certain plants such as lily family, then it’s better to avoid using aloe vera. Before using aloe vera gel, do a patch test. Baking soda contains the alkaline nature that helps to boost the healing of the skin from an allergy by restoring the lost pH of the problem skin. It also comes with anti-inflammatory and antibacterial abilities. You can also get relief from swelling and itching that comes with skin allergies or skin rashes because baking soda can dry the skin thanks to its alkaline properties. Add the water to the baking soda to create a thick paste. Apply to your affected skin with this paste and wash it off after roughly 10 minutes. Try this remedy multiple times every day for quick effects. In rare cases, when applied topically, baking soda can lead to skin rash. Baking soda isn’t advised for people with sensitive skin. Apple cider vinegar is loaded with compounds such as vitamins, enzymes, mineral salts, and riboflavin, all of which help to improve skin health. The acetic acid housed in apple cider vinegar exhibits amazing antimicrobial and anti-inflammatory agents, which can help to treat skin allergies and guard the skin against infection. Just add the ACV to the warm water and mix well. Then, soak the cotton pad in the mixture and start applying to your affected skin and let it dry. After 15-20 minutes, wash it off. It is recommended to reapply it twice every day until you see an improvement in the condition. Owing to its acidic nature, applying too much ACV to your inflamed skin can irritate it. So, dilute the ACV with purified water before using it. Holy basil or tulsi is useful for protecting the skin from microbial infections since it consists of broad-spectrum antimicrobial agents. It can also decrease the swelling, redness, and itchiness caused by a skin allergy thanks to its anti-inflammatory action. The leaves also prevent the bacterial growth such as E.coli and B anthracis causing skin infections. Take the prepared holy basil leaves at first and later wash them carefully. Then, you blend the leaves in the blender to get a paste. Start applying this paste to your skin and wash it off after 20-30 minutes. Redo the process multiple times every day for a couple of days. A compound present in holy basil known as estragol may result in uterine contractions. Thus, it’s best to avoid it during pregnancy. 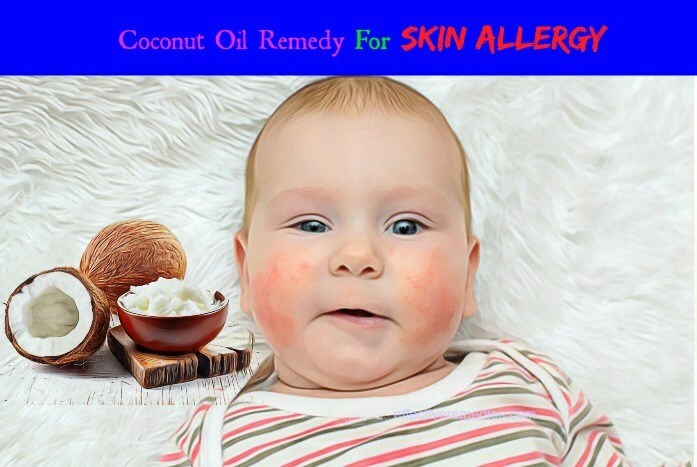 Coconut oil embraces anti-inflammatory and analgesic properties, which make it a potential remedy for eliminating itching and redness caused by skin allergies. This oil also aids in decreasing the presence of viruses, fungi, and bacteria on the skin because of its lauric acid. It is also full of medium-chain fatty acids, which possess moisturizing properties. Take some virgin coconut oil and rub the oil between the palms to warm it. Begin applying it directly to the problem area. Wash it off after 20-30 minutes and afterward, pat your skin dry. Reapply it 3-4 times every day for some days. If you’re allergic to coconut oil, avoid it. Perform a patch test before using it. Peppermint oil is well known for its menthol that holds numbing and anti-inflammatory effects that offer instant relief from redness and swelling related to skin allergies. It also works well for lots of skin conditions that cause discomfort and itching. Firstly, add the peppermint oil to the carrier oil and next, mix these oils well. Apply the mixture to your affected skin and wash it off after leaving it on for around 30-60 minutes. Repeat the procedure 3-4 times daily for a few days. If used in high amounts, peppermint oil does have several side effects such as allergic reactions, heartburn, and headaches. When it comes to the skin, tea tree oil offers numerous benefits. Owing to its anti-inflammatory and antimicrobial activities, this oil provides immediate relief from itchiness and inflammation and prevents further infection. When rubbed on your skin, it will fade away the fungi or bacteria responsible for the rash. Add the tea tree oil to any carrier oil of your choice and mix well. Apply this oil mixture topically to your affected skin and wash the application off after 30-60 minutes. To get the satisfied results, reuse this treatment 3-4 times daily. Avoid applying tea tree oil directly because it can cause burning sensation, skin irritation, and redness. Before using this oil on affected areas, perform a patch test. Avoid using this oil further if you notice any negative reaction. Ginger can work wonders in coping with a skin allergy because it composes of impressive antimicrobial and anti-inflammatory properties. Plus, these properties also help to soothe itchiness and inflammation related to skin allergies. Besides, ginger is a powerful cleansing and antiseptic agent that helps to keep the skin clean and smooth. The first step is adding the ginger slice to the water. The next step is boiling it in a saucepan and simmering for approximately five minutes. Then, strain and allow it to cool. After that, dip the cotton ball in this solution and apply to the affected areas. Finally, wash the application off after around 30 to 40 minutes. Follow this home cure about four times every day for fast results. If you suffer from diabetes, high blood pressure, and gallstones, check with your doctor before using ginger. Using petroleum jelly is one of the effective home remedies for skin allergy. It can create a protective layer on your affected region and inhibit further microbial infections. In addition to this, it helps to keep the skin moisturized, thus facilitating its recovery. Get a little petroleum jelly at first and then apply it directly to your affected areas. Keep it on and reapply as needed. Try this method for 1 to 2 days until your symptoms begin disappearing. Exposure to any product having petroleum can prompt reactions in people with allergies. Initial symptoms are a runny nose, watery eyes, and itching in the throat and mouth. Skin reactions may also happen, including redness, itching, and rashes. Lemon is chock-full of vitamin C and contains bleaching properties, making it an ideal remedy for skin problems. Lemon juice consists of the anti-inflammatory nature that is effective for relieving redness and inflammation caused by skin allergies. Apart from that, it prevents further infection to your affected part due to its bactericidal properties. Take the lemon and later squeeze out its juice. Add the juice to the warm water and mix well. Immerse the cotton ball in the solution and apply directly to your affected skin. Let it dry and wash it off. Repeat the process multiple times every day for several days. 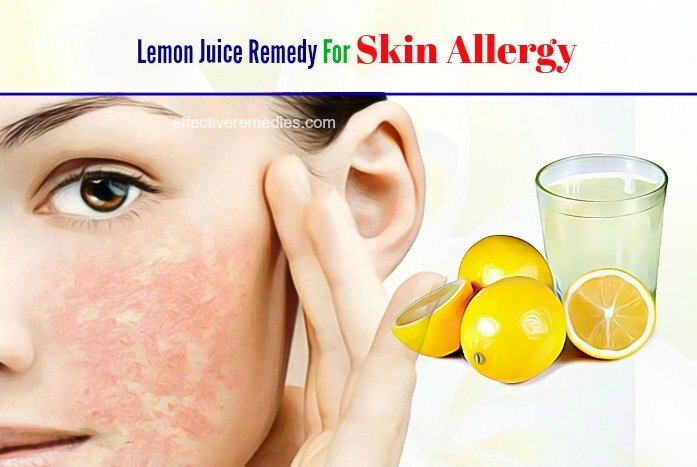 Avoid applying lemon juice directly on the skin because it can increase dryness and lead to itching and irritation if you have sensitive or dry skin. Manuka honey can help to encourage the healing process of rashes resulting from a skin allergy, as it owns powerful antimicrobial and immunoregulatory properties. In addition to this, it provides relief from redness and itching. It additionally works as a topical agent and treats skin rashes by restricting the microbial growth including dermatophytic bacteria. Get the prepared Manuka honey and apply directly to the problem region. Keep the application on for around 25 minutes before washing it off. To improve the condition, do the process 3-4 times daily for several days. In rare cases, individuals are allergic to either the pollen of the Manuka flower or bee venom, in which case, taking this honey can cause gastrointestinal distress and topical allergic reactions, such as itching or rashes. Neem has an emollient, antibacterial, anti-inflammatory, and antifungal effect on the skin. Neem comprises anti-inflammatory activities so that it can eliminate swelling, redness, and itching. Also, it is a natural antihistamine that can treat skin and other allergies. Grind the neem leaves to have a fine paste. Apply this resultant paste to your problem areas. Allow it to remain on for 20-30 minutes and wash it off. Follow this remedy three to four times every day until you see an improvement in the skin. Before beginning neem treatments, perform a patch test to avoid allergic reactions. If you notice itching, swelling or redness, stop using neem. When they come to skin care, guava leaves are beneficial for improving your skin and treating various skin disorders. Guava leaves comprise ethanolic extracts, which exhibit strong anti-itch and anti-inflammatory agents. These agents can soothe red and itchy rashes caused due to skin allergies. They are also an immediate cure for eliminating itchiness because they hold allergy blocking compounds. Wash the guava leaves and crush them. Fill a tub with water and add the crushed leaves to it. Then, soak in the water for twenty to thirty minutes and pat your skin dry afterward. You can also grind the leaves to make a paste and apply it directly to your problem skin. Follow this easy treatment twice daily. Nursing and pregnant women can eat guava in the form of original fruit. However excess consumption isn’t good. Bing abundant in vitamins A, C, and E, and beta-carotene and antioxidants, black seed oil is great for your body and skin as well. Plus, it is full of omega 3 fatty acids, which can fight external toxins and pollutants by keeping the outer layer of your skin strong. More importantly, this oil is chock-full of powerful anti-inflammatory, analgesic, and antipruritic properties, which all work wonders in treating skin allergies. Pick up a little black seed oil in your palms at first and apply this oil directly to your problem region. After around 45-60minutes, wash it off. You should use this method many times daily for a couple of days. Black seed oil can lead to an allergic rash with topical use in some people. Thus, it is crucial to do a small patch test to ensure that it doesn’t trigger a reaction. Oatmeal contains lots of biologically active agents, including anti-inflammatory and antioxidant components, which all can help ease the itching caused by allergic skin reactions. Being high in avenanthramides, oatmeal acts as an anti-inflammatory to reduce the irritation and swelling in a rash. It also consists of saponins that function as natural skin cleansers. Add the oatmeal to the bathtub of lukewarm water and mix the oatmeal well into the bathwater. Get into this tub and immerse your body. Rinse yourself by using a cool, gentle shower after 30 minutes. Add the powdered oatmeal into one mixing bowl and mix the distilled water into the oatmeal, one teaspoon at a time. Continue to mix and add water until you attain a smooth, spreadable paste. Begin applying this paste to your affected area and gently bandage the area by using a moistened cloth. Remove the moist cloth after thirty minutes and rinse the area with the support of cool water. Finally, moisturize the area. Do a patch test to ensure you are not allergic to oatmeal before beginning regular oatmeal treatments. If you are allergic to gluten or suffer from celiac disease, eating oatmeal may result in acne. Use Ice Cubes: Swelling and itching are the most uncomfortable skin allergy symptoms. Applying a cold compress to the affected part is the best way to control this discomfort. Just take 3 to 4 ice cubes and place them in a plastic bag. Then, place it on the skin and repeat this way 3 to 4 times daily to boost up quick healing. Add Anti-Itch Cream: OTC calamine or hydrocortisone lotion may relieve itching. Use A Cold Compress: A cold compress can help control pain and soothe inflammation effectively. Just take a soft washcloth and dip it in cold water. Gently apply it to affected skin for 15-30 minutes. Repeat this process multiple times per day for relief. Use Rice Water: Rice water will help to combat irritated and dry skin due to allergies. Just soak in bathwater with some rice starch for fifteen minutes twice a day. 1. Which Is The Best Soap For Skin Allergies? Soaps containing oatmeal such as olive oil or Aveeno are great for people with skin allergy. Another good option is Cetaphil soap. 2. Which Is The Best Medicine For A Skin Allergy? Your doctor might prescribe topical creams or antihistamines containing hydrocortisone to deal with skin allergies. 3. Which Cream Works Best For Skin Allergies? You can apply anti-itch creams containing ointments or hydrocortisone. If you are searching for safe and natural alternatives, any of the above home remedies will do the trick. 4. How Long Does It Take For Allergic Reactions To Disappear? The symptoms start fading away within several hours after the allergen has been eliminated for most allergic reactions. They usually clear totally in around two days. Bathe every day and stay clean to help prevent a skin allergy. Lessen your allergen exposure by showering or bathing every day to wash the dust, pollen, and other allergens from your hair and skin. Use an air purifier if you’re sensitive to mold or dust. Air purifiers can assist you in doing away with dust, pet dander, pollen, and residual smoke. They’re highly recommended to help lower your indoor allergy symptoms. Do not wear tight clothes since they can irritate the rash. Instead, wear baggy or loose clothing. Avoid contact with an irritant or allergen that triggers your allergy. Apart from following the above tips & tricks, you also need to pay much attention to your regular diet. Consume a diet rich in vitamins A, C & E because they’re essential for healthy skin. They’re also powerful antioxidants, which help to repair damaged skin and give your skin protection from toxic reactions. Besides, vitamin E manages swelling and inflammation with its anti-inflammatory properties and vitamin C enhances your immune system to skin allergies. You should eat foods rich in these vitamins such as carrot, garlic, broccoli, sweet potatoes, citrus fruits, kale, sprouts, spinach, nuts, and legumes. Avoid foods such as milk, eggs, tree nuts, peanuts, fish, shellfish, soybeans, and wheat because they are known to cause skin allergies. 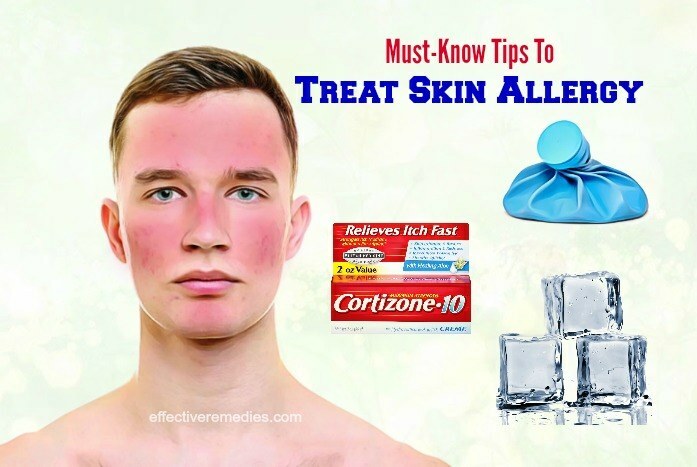 Skin allergies can be controlled with these remedies and tips. Follow them without fail to get the best results. 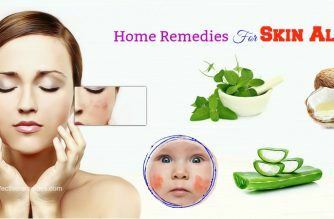 Do you know other home remedies for skin allergy that work 100% naturally and effectively in adults and children? If “yes”, please share with us. Was this article helpful and informative? Tell us in the comments section below.